Jade and Josh gave a wonderful presentation and this commentary accompanies their beautiful power point. (2) Time is one of the most important things to consider when working with young people, and this may not be for the reasons that one might consider obvious. As young people, we have been volunteering with Amgueddfa Cymru’s Youth Forum for two years, which has given us an insight and ideas about how youth engagement with heritage and culture is handled within an institution of this size, as well as giving us the opportunity to consider ways that it might be improved. Time in this discussion can take many forms, such as that as project length, activity length, museum timescales as well as individual timescales. (3) Young people have busy, fast-paced and dynamic lives which stand in contrast to the slower pace of museum programming. While longer activities and projects are appreciated, there is a danger that young people will become disinterested in a project if they see that the project itself is not moving along. We are not suggesting that activities and projects must be short. We suggest that in order to maintain a sense of progression and achievement, thus keeping momentum and keeping young people engaged in a positive manner, that the project should be split into many smaller, diverse tasks. We consider that there is a place for a core of admin-esque young people who can and want to take a more responsible role in regards to organisation, time management and human resources but it is important to remember that not all young people want to do this and not to force them into this role. Through this planning, there can be several activities that contribute to the forward thrust of the project. These activities can range from a workshop spanning an hour, to projects that span several sessions. We think that the key here is having a clear idea of the end aims of the project, and then splitting up the actionable tasks and matching activities to suitable age ranges, groups or ability levels. This can open the door to greater diversity and representation within the museum space whilst still being respectful to those diversities. Using this kind of system, it may also be possible to create a dynamic and mobile project which can be progressed in multiple locations before coming back to Amgueddfa Cymru at its culmination. Another area that we feel it is important to alter is how projects and activities could be better organised/managed to allow a greater diversity in young people volunteering or engaging with the museum site. This could be done through smaller, one day events to create or collaborate that reaches a broader number of young people who may be unable to make the time commitment that volunteering, such as the Youth Forum, often requires. This could allow young people to get involved in meaningful ways and gain the satisfaction of doing something productive/useful, even if they might be in a position where they cannot engage consistently, such as if they work full time, care for a relative, study or lack the confidence to take the plunge into the unknown. It could also open the doors of opportunity to young people who may not even know that they can engage with the museum sites! (4) As exhibition programming is usually decided several years in advance, main projects can be frustratingly slow to young people as it is extremely unlikely that the same young people can work on a main project until its conclusion. This means that the young people leaving the project rarely feel satisfied with their contribution and those starting feeling adrift with the current progress. Due to this it may be of more value to involve young people in shorter, more dynamic events that they can guide and feel invested in and there is a great importance to having a vision of the project, perhaps chosen by young people themselves, that they can invest in and understand its trajectory. If the project is too nebulous, young people may feel overwhelmed and unwilling to invest their time and energy. Due to these factors, young people may decide that they would rather not give any time to a project because they will not see its end. Perhaps some would see it as a waste of their time. It may be that young people experience time differently, the lives of young people can vary considerably over the time period of a project at Amgueddfa Cymru. They can start and end school, university, get a full time job or even start a family. If they are unable to see a project to its completion, perhaps activities can be tailored in a way that benefits the young people while still contributing to a project. (5) Young people can be more aware of current trends, and this is an area where the museum may be reluctant to encroach due to the idea of museum neutrality. These topics probably will not become the apex of the year’s events, however by taking a stance on contemporary issues the museum could open its doors to new audiences. These topics could be chosen by young people, although we understand that this is a difficult topic that as many risks as it does opportunities, but that is a topic for another day. A way that this could be achieved without fully compromising the idea of museum neutrality is by allowing groups of young people and volunteers to tackle these issues in short projects, say 3 months to a year in length, that build towards an exhibition or an intervention. This can be flexibly arranged around other museum events. By tackling these topics in a short time there is less of a risk of ideas or facts becoming outdated, as would be the case for a mainline exhibition on the same topic. These youth-led and youth-focused projects allow multiple groups to become involved in different activities as well as giving the opportunity to young people to gain experience in organising and executing an event in the museum which can give young people a practical opportunity as well as harder to track, subjective individual achievements such as entertainment or working with others. We have found that when working with young people in Amgueddfa Cymru, that there are many reasons why they wish to engage with the site, as well as many ideas about what they would like to get out of it. This is not usually a straight transaction idea – that the young person contributes in order to gain something – but usually much more personal with varied outcomes. We think that it is important for these aims to be talked about and addressed where possible, to contribute to the dialog between the museum and young people, to build a rapport between them and relevant staff members and create an environment where young people feel like their time and effort are recognised, valued and rewarded, where possible. (6) We believe that there is an opportunity to reflect upon current working practices between young people and institutions such as Amgueddfa Cymru that may not require the remaking of the wheel, but small tweaks that can greatly improve the relationship between the two. By considering the aspect of time and addressing the stumbling blocks that come from a deep-seated difference between the experience of time for the individual young person and the museum-structure. We hope that there is an opportunity to use these differences to influence a better system that benefits all. From the museum’s perspective, they may not be getting the greatest return on investment from their young volunteers using the current practice method. Young people may not be satisfied with individual experiences which can lead to young people leaving projects, or not fully engaging with them. Do the co-ordinates within the museum recognise the various reasons why young people engage, and how can they help achieve the aims of the young person? By considering these factors surrounding the issue of time, a system of shorter or smaller projects, chosen and guided by young people with many opportunities to involve a variety of groups and individuals may be possible. Such a system could increase the diversity and dynamics of those working on a project whilst also enabling those who may not want or be able to engage full-time to be able to contribute in a meaningful way. (7) From the perspective of the young person, do we feel that we are gaining something of equal value to the time and effort that we put in? Do we find it fulfilling, and in what ways are we measuring this subjective ‘fulfilment?’ If we do not feel that there is a balance, is there someone that we can talk to about improving the experience and who is able to take this action? Is there ultimately a choice for the young person where one considers whether their engagement within Amgueddfa Cymru is appreciated, and is it still worthwhile to remain? We hope that you have found our opinions on the concept of time interesting. We think that this is but one facet to consider when analysing one’s approach to youth engagement. (8) One of the other main issues that can be faced by young people looking to participate in arts in locations such as the museum sites is a lack of trust in the institution and the people who embody that power and influence. This idea of trust is subjective and incredibly hard to monitor or measure, which perhaps leads it to being overlooked in working practice. Young people may not see that the museum as a whole is trustworthy and there can be many reasons for this. 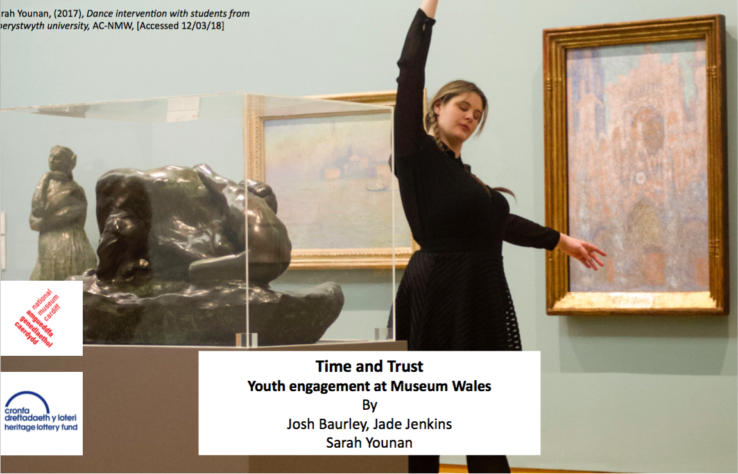 This perception of trust can influence the demographic of young people who enter the museum sites and perhaps is of an influence on those who choose to volunteer their time there. (9) Perhaps controversially, should the museum framework be trusted by young people? This is a hard one to answer, but we have experienced that some young people do not trust the museum space. Some view it as the domain of a particular demographic which they do not identify with. Other young people see it as a representation of ‘The Man’, and do not consider it a safe space. Perhaps it’s the highly traditional settings and connotations of the museum that put some young people off. Perhaps the museum seems too much like a school, with the connotations of authority. It may even be that the museum is just not “cool” enough! These are not issues that are fundamentally changeable, however the ideas of young people may be malleable enough to alter. If the museum itself cannot change, and certain people aren’t coming into the museum, how can we take the museum to them, and change their perceptions through positive and rewarding experiences? (10) Young people may not trust the museum because they may feel that they are being used for tokenism or box ticking, rather than being valued as an individual. Some internal projects may have an aim for feedback from young people, and this can lead to closed-ended activities or sessions with volunteers, where the young people are ‘involved’ in a project but are not allowed to influence the project outcome or direction in any meaningful way. This can lead to the young people feeling used, and not feeling trusted by the museum, especially when there is no feedback about how their input was used. (11) In other situations, young people can be used for tokenism to present a particular image of youth engagement at the sites. This can present an image of the nationalities, skills or level of engagement that is present within the group of young people which may not accurately reflect the whole. There may be a skew to show a particular nationality as being strongly active within the youth engagement, or perhaps showing more of one particular gender. This bias can feel like they are sweeping issues under the rug, or using the false image to entice more of a desired demographic into engagement, which is not currently happening. It can be a fine line between engagement and tokenism, and recognising where this line is drawn is a valuable skill of the engagement staff. When does an activity or approach become tokenistic rather than holistic? We are not sure, but we think that it is food for thought. (11) What can institutions do to build up trust between themselves and young people? They could take a more sympathetic stance towards young people and place a higher value on the time given by the young person. They can open more doors to opportunities for young people to engage with the museum structure – if that was something that interested them – and have a more open approach to young people getting involved with more ‘professional’ projects with a longer time scale. This will not suit all young people, but for some it might provide a valuable insight and experience. The museum could also build trust with young people by acknowledging their interests and concerns in a respectful manner, rather than brushing them aside or refusing to engage with the goals of young people. (13) The museum as an institution could also build trust with young people by recognising the varied aims of the young people who want to engage more with the museum structure; to ask questions and find allies. This would be best achieved if staff were to move out of their comfort zone to engage with young people in neutral spaces, without making young people feel out of place or patronised. Young people also would like to receive feedback on contributions they have make, and have the opportunity to discuss and influence how their output is used if the project has a next step. They want their output and suggestions to be valued by museum staff but do not want to feel that they are being pandered to. For example, young people are aware that not all of their ideas or feedback can be implemented however by staff acknowledging this and explaining why certain points were not carried forward in a candid manner, such as project cancellations, direction changes, budget, or misjudged time, a rapport can be built that can lead to trust between young people and the museum staff. We, as young people, understand that when we give our time and energy to a project through our volunteering, that we will not be rewarded in a traditional manner, but neither does it have to be totally intangible. This could be tailored to individuals and groups, and will likely vary considerably. For some in our group, a tour of the geology department was greatly rewarding, for others they wished to gain access to staff training modules to learn transferable skills. These incentives offer a branch of hope to young people and this can help build trust between museum and individual, showing that the individual’s contribution is valued and is not just a labour of hope. (14) On the other side of the coin, are young people worth trusting? Does the museum see the influx of different young people as an indication that they are not fully committed, and therefore not worth trusting? Or perhaps because the faces change so frequently, that there is no point trusting because familiar faces will soon leave. Although this is rooted in factual ebbs and flows within youth engagement, we do not think this should be used as a reason to distrust young people. One of the issues that the museum may face in regards to trust is that young people are not seen as trustworthy. Often described as disengaged and disillusioned, they are usually digitally-savvy and globally connected, and do not necessarily trust the traditional narratives presented by sites such as Amgueddfa Cymru. This can lead to a situation where young people continue this distrust of the narratives conveyed onwards to the individuals involved. Young people may be more willing to question and interrogate these traditional stances and attitudes which could be seen as a threat, adding to the general distrust between parties, but we think that this dichotomy can lead to some interesting dialog and progressions that can be navigated in a respectful but insightful way. (15) It does seem like there is a relationship between trust from the museum and progression of young people who engage with projects. Currently, our Youth Forum accepts young people aged 14-25, but we do not think that cultural participation should stop at 25, and neither should a desire to engage with museum projects. Currently there is not an avenue for this conveyer belt of young people-becoming not-young people to progress or develop within the museum. Their time volunteering with the museum would have given them a broader set of transferable skills that would be valuable elsewhere. They can progress to the general volunteer pool for the museum however this leads to a great back-step from the engagement that they experienced whilst in the Youth Forum. One could also imagine a scenario where it is not seen as ‘worth’ investing time and skills into young people because they are unlikely to use those skills to improve the museum in the future. We would love to see these people form a larger skill network that can still engage with projects, where they are relevant to the individual, and continue to share their thoughts and skills even when they are no longer a ‘young person’. This could allow the museum to retain some of the skilled people that they have been shaping and could allow the individual to feel more trusting of the museum site. (16) As the young people are volunteers, they are not afforded the same level of trust and autonomy as an employee. A young person may volunteer for a while and then disappear, or only engage on certain projects or activities based on a whim, which can contribute to the reasons that young people are not trusted by the museum. This is totally understandable, however there are times where young people are dedicated, hard-working and smart enough to contribute in professional ways, but may be given few opportunities to do so. This is once again highly dependent on the specific young people involved and their desires, but we think it would be of benefit to allow these individuals more trust, perhaps through asking for their contribution in a more professional way. There is a fine line here between gaining experience and the work becoming a labour of hope with no chance of progression. We think it would be a way that young people could perhaps progress into tangentially related projects that are rewarding to both parties. (17) The concept of trust between young people and sites like Amgueddfa Cymru is incredibly complicated. It is an issue that we think deserves more thought and experimentation to find a balance that works for both parties. We do not think that it will be easy, but it appears achievable and of great value in the long term. Trust is a two way street! We hope that you have found our opinions on the concept of time and trust useful and we hope that it will positively influence how you engage with young people in the future!